Wow, just a little gap in posts here. Another to Casper, Wyoming for the solar eclipse where I had a world-class boondocking spot. The eclipse was damn cool. We were in the path of totality. Did some fun other travel, both personal and work--especially New York and L.A.
Had a not-so-great trip to Canada over the Christmas to New Year holiday, crazy cold and other things. It was my first time to Banff. It was -40 F many nights and subzero until the last two days when it peeked above zero. No Airstream on that trip. And . . . decided to sell my Airstream! I love it, but it still needs work and I hit my limit on putting money into it. It looks like I've found a nice new home for it! Sure hope so. And the coolest thing of all . . . in October I helped rescue a tyrannosaur! Read more about that here. 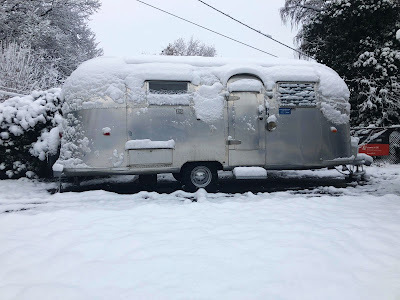 The final shot of my 1962 Airstream Safari. It's headed to a new home. Our time together ended up being brief, but I loved it. It was also an important step for me toward the road of becoming a recovering Airstreamer. I still love them, but my fixation is maybe a bit more healthy now.